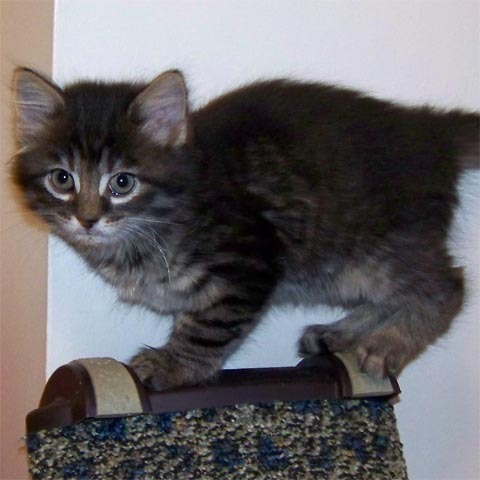 a medium-haired dark tabby with a heart-shaped face, Bunnyfoot was a happy-go-lucky goofball, the smallest kitten in the Lucky 13ers litter that arrived at 50K on New Years Day. She loved to chase her siblings around, wrestle, and swat the hanging ball. With eight kittens and mom-cat Angel sharing the villa, the floors were always liberally coated in sawdust from the litterboxes, so Bunnyfoot often looked like a fast-moving dust-mop. With her great looks (she reminded us of Ringo), we knew Bunnyfoot would be snatched up quickly, and she didn't disappoint us. She was adopted along with her tabby sister Clover as soon as she was big enough to graduate from 50K.